Publication Design The primary mission of the Metropolitan, as a public art museum, is to collect, conserve, and exhibit original works of art, and to make these collections accessible to the public through publications that help visitors to learn and appreciate these works of art. 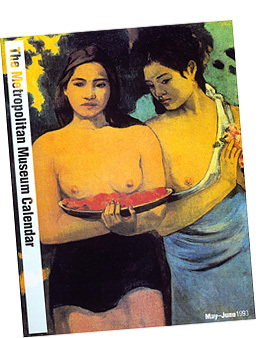 The Met Calendar was created to convey the splendid legacy of the permanent collection as well as the excellence and depth of the traveling exhibitions to the Museum's myriad publics as conceived by Philippe De Montebello, the eighth Director of the Met. Design Latitudes was retained to develop and digitally produce the calendar on the computer over a three-year period in the early '90s. Incorporating the traditional Met logo, the cornerstone of the museum's visual equity, we created a refined and digitized version to strengthen the brand of the calendar.